Welcome to GM Bookkeeping, located in Little Sutton, Ellesmere Port. My name is Gill and I am a home based bookkeeper and accounts assistant. I provide accurate and affordable bookkeeping services to small businesses throughout Ellesmere Port, Chester & Wirral. GM Bookkeeping offers a friendly, approachable service, so please feel free to contact me for a quote. Unfortunately, GM Bookkeeping is unable to take on any further VAT registered clients at the moment. Most businesses and self employed individuals don't start up a business because they enjoy dealing with paperwork, but maintaining accurate accounting records is very important and a legal requirement. Maintaining the books are vital for controlling your businesses, managing your cashflow, viewing how well the business is doing (your profit) and saving you time and money in the long term. However, keeping up to date with your business finances and paperwork can be a difficult and time consuming process; time which could be better spent elsewhere. This is why hiring a bookkeeper can be so benefecial to you and your business. Whilst hiring GM Bookkeeping you can be using your time to market your business, sell more or just spend valuable time with family. You could also save yourself money in accountancy fees and avoid HMRC fines. Let GM Bookkeeping relieve you from the stress of writing up your books, so you can enjoy running your business. What services can GM Bookkeeping provide? GM Bookkeeping can provide high quality accounting records. These can range from maintaining manual cashbooks, processing excel spreadsheets or maintaining everything on a computerised accounting software (I use VT Transaction+ software). From one off jobs where I process a full years information, to weekly or monthly bookkeeping, GM Bookkeeping is here to help you. GM Bookkeeping can keep you fully informed of your turnover, gross profit, expenses, net profit, customers who owe you money, supliers who you owe money to, your true bank position and VAT return processing. 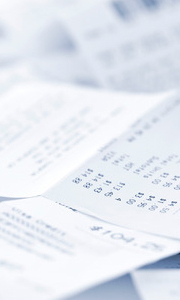 Please see bookkeeping services for more information.